Kaveh Askari <askarik1@msu.edu> is an Associate Professor of English and Film Studies at Michigan State University. This transcript is an edited version of an eighty-minute interview conducted at Northwestern University on January 5, 2018 under the auspices of the Society for Cinema and Media Studies. The Fieldnotes project of SCMS aims to trace, through discussions of the career trajectories of pioneers of film and media studies, developments that have shaped–and continue to shape—the expanding field. Kaveh Askari: Let’s start a little earlier than some professional biographies and talk about childhood experience, because it is something you have written about and something that scholars working in exile sometimes braid into their work. 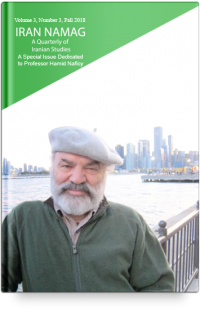 Hamid Naficy: I was born and raised through high school in the city of Isfahan in Iran. As a kid, my first memory of movie-watching is going to the theatre and the movie-house with my dad. Thief of Baghdad was one of the early ones I remember. I also watched a number of films in the fifties that were based on literature, like King Vidor’s War and Peace and Jean-Paul Le Chanois’ Les Misérables. I had read the novels before. In this case, one medium sort of led me to the other. I think one of the early intersections of two media or intertextuality for me as a kid happened there. I had read the novels, I would go to see the movies. Then a neighbour of ours gave me a 35mm Agfa camera and I took this camera with me to see the movies. I clearly remember trying to take a picture of Audrey Hepburn in War and Peace; I was holding the camera like this, holding my breath, making sure that my hand wouldn’t shake when I took the picture. That’s how from early on I had a fairly multi-media relationship with film. Just to answer your question a little bit more, the role of foreign cultural societies in my childhood was very important. The Soviets had their Iran-Soviet Cultural Relations Society in Isfahan, the British had The British Council, and the Americans had the Iran-America Society, where they not only showed films, but also taught languages and had libraries. Interestingly, when I was in elementary school the United States Information Agency, USIA, began to train Iranians in making documentaries. They brought a whole new phenomenon of film screening in Iran, as well, which involved showing films via mobile film units. These were Jeeps that had a driver who was also the projectionist. He would carry 16mm Bell & Howell projectors with screens. He would come to our school every Thursday afternoon, the day before the weekend, and set up his screen in our library and show a USIA film. KA: All USIA films or other kinds of films? HN: USIA films, which included films on development and agriculture, Iran News newsreels shots in Iran, and newsreels about life in the United States. He would travel from that school to villages nearby and show the films. The thing which is remarkable for me is that I have a notebook that contains 16 film reviews which I had written of USIA films at age nine while attending that school. I don’t think that was based on my own initiative. I think that was a requirement by an enlightened teacher. So that’s another aspect of film viewing and reviewing and criticism which was embedded into my experience from early on. KA: So, there are two different dimensions to the film-going that you are talking about. One is kind of an institutional dimension with USIA educational film; the other is commercial film-going. Were there overlaps between these two worlds in terms of film fans or was that something unique to your particular educational experience? HN: I think anybody who was going to that elementary school (called Nemuneh Elementary) had similar experiences. By the way, that school was built by funding from USIA in Iran, and served as a model for modern schools. It had an open-stack library, which was very unusual. All the libraries in Isfahan in those days were closed stacks. You had to go and ask for a book and somebody would fetch it for you. In this library students would just browse and find the books they wanted to read. There was a film club which had just opened up and they would generally rent commercial cinema and show films Friday mornings, when nobody else would go to see movies. I attended that film club’s film screenings a few times. There were very few, like 10 or 12 people, in the huge cinema watching some arthouse film, mostly foreign stuff. When I was a kid I also tried to build a film projector and failed! That was miserable! I tried to build a radio receiver and I failed, again! I still remember the regret and sense of frustration, but that’s how it goes! KA: What were you watching at the time you were contemplating studying abroad? HN: The films that I remember were these literature-based films that I mentioned, as well as Richard Brooks’ The Brothers Karamazov. I had read the novels and looked for their filmic adaptations. Reading was a big thing in our family and all the kids had actually pulled together a children’s library which by the time of the revolution housed some 5000 volumes, many of them children’s books, which was an incredible treasure. So, we did a lot of reading and writing. KA: And then your parents supported your desire to go abroad. You went to England first, is that right? HN: Yes, I went for a year to the UK in the early 1960s. My dad was actually a well-known physician and for his heart specialisation went to Harvard. He also brought back with him a present for me which was one of those View-Master slide viewers with the disc and you click on it to change the slides. So, actually, for the first time through the agency of my dad I became Americanised; not only by watching American films with him before, but [also] through these slides of national parks and so forth I began to sort of imagining myself there. So, there were multiple strands that turned me towards media, in particular film, and also toward the States as a site for education and college. KA: How was that experience of arriving and studying into the US? KA: So, film studies was there for you from the start, but your major was in production? HN: Both. Not film production, but radio and TV production. Courses were generally broadcast- oriented, like management or analysis of history of radio, history of television, with a few production courses thrown in. KA: And after that point you’d gone into MFA at UCLA. KA: That was in film? HN: Yes. That was in the department of theatre arts which had both film and television. It was a heady time, from 1968 to 71, and the counter-culture movement, the anti-Vietnam war and the civil rights movements were all on. Students were actually taking over offices of the faculty at UCLA. I remember a group of students took over Howard Suber’s office. He said to me later that he evacuated his office and gave it to the students for a year to run things from it. Students took over the department’s remote van and went around campus filming various activities and demonstrations. Then, they took the van to different locations on campus and played back the tapes, so people could see. As a group of 11 students in the MFA production program, we petitioned the department to give us a course that we, the students, would design and manage, and the department agreed. It was an unusual thing, part of the counterculture ethos. So, we were eleven students running our own class, in which I made some of my early shows, both documentaries and surreal, experimental films and videos. I was at the time living in a leftist, hippie commune called Ellis Island, so I made a documentary, Ellis Island: A Commune (1969), which captured it during an important period of transition. KA: Were there any particular interlocutors in the MFA programme that stand out to you? Because it seems like a very collective experience. HN: The faculty were very hands-off and that was an advantage for people who knew what they wanted to do, and I was one of those. I became interested in doing for my MFA a film, using computers, in the days when computers were primarily accounting machines. There was this hotshot group in the computer science department at UCLA. A young professor, Leonard Kleinrock was running it. I went to him and said I’d like to make a computer-animated film about the consciousness of the external universe and the internal human consciousness within us. And I said to him, “I would like you to be on my committee.” He said: “Fine, I’ll be willing to be on your committee, provided that you go on and take a Fortran class and do not bother my staff and graduate students, and you have access to the computer room only after 5 o’clock.” I said, “Fine” to all of his restrictions and conditions. I went and took the courses and did well in them. In two years, by the time I was about to finish my MFA film, Salamander Syncope (1971), I had six system analysts and programmers on his money working on my project, one of whom is now a major figure in Google. His name is Vint Cerf, the Chief Internet Evangelist at Google, often credited as the co-inventor of the Internet. My project was arduous, because I was moving out of the normal realm of the film production into a highly technological and evolving one involving the new medium of digital and analogue computers. So, it was a very good experience and UCLA was a very good place. My interlocutors at that point were really more computer guys than film guys. KA: So that was your MFA film and you graduated. Did you go back to Iran immediately or start make films in L.A.? HN: Again, I have an experimental side and always look for new things, like new media. After I finished my MFA, the first cable company opened up in LA. Theta Cable Television, Channel 3, opened up in Santa Monica, and I was one of the first people they hired as producer/director for their original programming. For two years I directed the daily newscasts, a weekly discussion show, and occasionally children’s programming, Theta Cable Fable Car. It was a fantastic experience at local programming and production. Then I got an invitation to go to Iran to help plan a new multimedia university that was patterned after Open University system in the UK. So, I returned to Iran where for three years I worked with a dynamic group on its planning and soon it became a reality, as Free University of Iran (Daneshgah-e Azad-e Iran). The Shah approved of the plan to start this multimedia university which was really innovative, because we didn’t have a main campus like most other universities. But we imparted our educational material through books that we published, for which the university established the largest publishing house in the country. In conjunction with the National Iranian Radio and Television Organisation we produced radio and television programmes. We produced science kits, which the students would receive and take home and with which they could conduct 150 experiments in their kitchens. There were twenty study centres in different parts of the country with tutors available to help students. Copies of university’s radio and television programs were also available there. It was a very integrated and media-intensive situation. We had taken in the second year of our students when the tanks came into the streets and the revolution was on. About that time, my request for a sabbatical had come through, fortunately, so I decided to return to the US to see if I wanted to do further education and graduate studies or to continue filmmaking. So that was a major transition for me away from Iran. KA: I’m curious about the collaboration between NIRT and this Free University. Was the university designed to work with these other institutions within Iran? I’m trying to get a sense of how those infrastructures were forming in the 1970s. HN: The head of the university was Abdolrahim Ahmadi who was a well-known literary person, whose translation of Grapes of Wrath I loved when I was a high school kid. He had published it under a pseudonym. But he was a learned man, well connected to various institutions and had a mandate from the prime minster, Amir Abbas Hoveyda, to create this university as approved by the Shah. So, he had approval at the highest level. At the same time this university needed to connect with other institutions, as you mentioned. We brought in the entire editorial staff from Franklin Publishing, which was a major publisher of pocket books in Tehran, to come on board and become the editorial department for the book publishing in our university. We contracted with the Educational TV network to help produce and broadcast our radio and television programmes. The Broadcast and Media Center, the unit that I directed at the university, hired the producers and directors and sent them to the BBC to be trained in production. Upon their return, they used the Educational TV’s studios and staff to produce our programmes. The heart of the university which, I think, was ingenious and was borrowed partly from the UK system, was a course team that designed and produced all the educational materials collectively. For example, the course team for the science course would consist of a physicist, a chemist, a biologist, and a mathematician, but it would also have a textbook editor, a radio and television producer, a kit designer, and an educational technologist. All of these would work together to decide on what material would go to the kit, to radio or TV, or to textbook. Together they produced the various components of the course. It was kind of unusual in the atmosphere of authoritarianism and distrust endemic in Iran at the time. It’s interesting that after the revolution this university was divided up and dispersed. A lot of it went to form the Allameh Tabatabai University. The whole text production became Nashr-e Daneshgahi, the university publisher, which is the biggest publisher in Iran. But then a new Islamic Free University was created in its place which has none of these features we are talking about. KA: And that was when you wrote your first book-length project on documentary? HN: That’s right. It’s a good point, because at the same time that I was working at the Free University of Iran, I also taught in the College of Cinema and Television a course on the history and theory of documentary cinema. There was a lot of material written and published in Persian about documentary films, but there wasn’t a single book yet. So, as I began to teach and prepare my lectures, I saw the beginning of a book forming and it became a two-volume book in Persian, Film-e Mostanad (Documentary Film) which the Free University of Iran Publishing House published. As it was being published the revolution happened. The book sold out immediately and no more copies were produced, because the publishing house also was transformed. I received only three copies of the book after I returned to the US. There was a great deal of interest in reprinting it, and in one of my return trips, the director of the new University Publishing offered to reprint the book if I amended it, particularly by removing some of the stills of women who showed too much skin, which were considered inappropriate for the new Islamic era. I refused. So, for many years the Xerox copies of the book were available in bookstores in Tehran. That is the story of my first major publication. KA: And some of your other publications in journals like Jump Cut on documentary came out of the same project. HN: Yeah, gradually they came out of the same project…Jump Cut and Quarterly Review of Film Studies. In addition, I began to publish a series of interviews I had conducted with direct cinema documentarists the Maysles brothers and Richard Leacock, and with verité filmmaker, Jean Rouch. I had kept all of those interviews that I had done in preparation for my Persian language book and so transcribed and edited them and they were published in American journals. KA: So, we’re kind of going back now to LA. You took a sabbatical from the Free University? HN: Which became permanent! I came back to LA and began working in television for a while. The UCLA had an internal production house for producing educational shows and I became a producer-director in that outfit, one among seven producers-directors. While there I produced or directed several major series, like a twenty-part TV series, Mastery Teaching, designed to train teaching assistants, a 14-part TV show, The Tutors’ Guide, for training tutors, or a 14-part radio show called Power in America. Then I made a whole series of television shows for the American Medical Association on various topics like hearing loss, obesity, asthma, COPD, and sexually transmitted diseases. These were two-hour tapes plus study guides that we produced. It was very technical material, but it was fun and I enjoyed the process, having come from a family of doctors. As a result of making the hearing loss show I was also able to make another film that was award-winning. It was called Beethoven: Triumph over Silence, for which I worked with a famous otolaryngologist, Dr. Victor Goodhill. We basically tried to recreate what Beethoven would have heard before he lost his hearing and how he lost it and in what frequencies he lost it. Because after he lost his hearing, he communicated with people by writing in a notebook, and other people responded by writing in his notebook, and these notebooks exist today; we had a remarkably intimate record of what Beethoven thought and felt and said. We used these writings as part of the narrative of the film and recreated audio-wise how he would have heard, for example, when he conducted his 9th symphony and he went out of synch with it. We have his notes as to how terrible he thought of what he had done. But we were also able to recreate his hearing loss in the first, say, 30 seconds of the 9th, which conveys the drama and the tragedy that Beethoven felt to contemporary audiences. KA: Was it around that time that you started thinking about doing a PhD? HN: Yes, because I was on the UCLA campus all the time anyway, and also at this point I had gotten to know a lot of Iranian Studies and film studies people at the UCLA. So, I applied for the PhD programme in film-TV and got in. Our professors were Nick Brown, Janet Bergstrom, Steve Mamber, Teshome Gabriel, Katherine Montgomery, Robert Rosen, and Howard Suber. These were the core faculty, but I worked mostly with Teshome Gabriel, who was my advisor and a friend. KA: And you edited a book together. Was it while you were a student or after? HN: I was still a grad student…almost finished. Working with Teshome I put together a special thick issue in 1991 of Quarterly Review Film and Video (combining three issues into one) on postcolonial cinema, which we later republished as a book, Otherness and the Media: The Ethnography of the Imagined and the Imaged. I had begun to study the Iranians in diaspora for my PhD. I remember Teshome advising me not to choose an Iranian topic. He said because you are going to be branded as an Iran specialist and pigeon-holed, which I think was a good advice, but I didn’t take it, because I was personally interested in that topic and I was very knowledgeable about it. I had followed all these Iranian exiles with their television and radio programmes and pop music. Iranians were very active in those days and media-savvy, because many of those who came to LA were media people already. Producers, dancers, singers, actors, directors, musicians, all kinds of people were there. In one decade, Iranians in LA produced nearly 90 periodicals in Persian language alone, and these were all commercially-driven, which means they had to have had fairly strong cultural and economic capital to invest in advertising and to sell products to Iranians. They produced over sixty television shows. I began videotaping these programs and going to their studios and interviewing them. I had a lot of stuff that nobody else had, why give it up? Plus, working on the Iranian exile meant I was also working on trying to figure out my own situation in exile. By the way, all of the videos and research materials I collected for my dissertation project are now on deposit at Northwestern University Library Archives, where they are being processed and catalogued for use by other researchers. KA: And that was the genesis of Iran Media Index and the dissertation project, right? HN: They were two different things. That was the genesis of dissertation which in a couple of years became my next book, The Making of Exile Cultures, in which I basically paid attention to the totality of pop culture of Iranians in Los Angeles as an alternative home, the home that they didn’t have or had escaped because of the revolution, and the home that they longed to return to. So all of these feelings and nostalgia and longings were embedded in the shows and they were very political as well as cathected. I think that the book established a model for ethnic television studies which hadn’t been on the horizon very much yet. KA: Just as follow-up to that, you were working on Third Cinema and post-colonial questions and then you choose to start with this television study. Could you say something about that choice? HN: It’s because television and radio were the media for the Iranian exiles in LA to communicate not only with the exile community in LA, but also with the diasporic community of Iranians elsewhere and with Iranians in the homeland. Eventually these individual television shows which were broadcast on lease-access televisions at first became 24-hour satellite channels. Right now, there are somewhere around two dozen satellite channels in Persian language being broadcast out of LA and are received in Iran. They have become kind of a force in some of demonstrations that are going on this week, for example. So, this was a significant new development in the media and exile world. A lot of Iranian filmmakers who are in exile turned to television, because that was the medium with which they could communicate with large audience. So, film was put on the back burner for a while. But the thing that I want to mention is that around Teshome Gabriel a number of students gathered; not only students and faculty in film, but also those from literature, political science, anthropology, and other fields. We used to get together on Friday afternoons in one of the cafeterias of the UCLA (Lu Valle Coffee-shop), and just B.S. and talk about post-colonial theory, Third Cinema, Third World Cinema, etc. Eventually these gatherings led to the production of two magazines. Emergences was the one that I was involved with. This sort of led me to get involved in academic journalism. It’s interesting that at around this same time, Beverley Houston and Ron Gottesman, the editors of Quarterly Review of Film Studies which was at USC, asked me if I wanted to become the managing editor of their journal. Delighted, I accepted and, so as a graduate student, I was suddenly basking in the glow of all these academic film studies people in southern California and elsewhere. I was the traffic cop for the magazine. KA: It was an important time for that journal, too. HN: Yes. For the journal and for film studies. Because also the turn to theory had occurred, so there was an incredible excitement. Everybody was turning to feminism, psychoanalysis and cultural studies, deconstruction, postmodernism, etc. All of these concepts were coming into film and media studies and it was a very exciting period. That’s how I ended up being on so many editorial boards and advisory boards of culture and media journals, from Diaspora to Framework. KA: And I want you to talk more about the turn to theory and how it figures in your own work at the time. But before we do that, I was trying to figure a good place in the chronology to talk about your programming work and I thought maybe talking about it early on can be an interesting place to put that question, because of all of the controversies surrounding some of your early programmes. HN: That’s right. They had lost their careers and they were angry; personally angry. I was able to establish a relationship with the Ministry of Culture and Art. I asked for 44 films that I had selected. From them I selected 22 or 24 films for exhibition in this decade of Iranian Cinema event and I invited Abbas Kiarostami and Dariush Mehrjui to come and show their latest films and interact with the audiences. But as soon as we announced the festival, the Iranian television producers came out against it and said that it was a whitewash of the Islamic regime and we were being paid by Islamic republic and blah, blah, blah. On the night of the opening many well-known filmmakers, television producers, actors and so forth came out against it, holding placards [saying] “Down with the Festival.” I was walking with our guests Kiarostami and Mehrjui into the cinema [in] the Melnitz Hall, which was the site of the screenings when Kiarostami walked to one of them- I think it was Parviz Sayyad- and said: “Why don’t you give me your placard? I’ll stand in the line demonstrating against the festival. You go inside and look at the films and see if you still want to demonstrate.” The fact was that none of them had seen these films. They were just categorically opposed because they were made under the Islamic regime. The most interesting thing for me as a programmer was the response of the audiences coming out of cinema. Many of them were crying. These were adult people, professors, [who were] crying on my shoulder, thanking me for giving them the opportunity to see Iran from the point of view of Iranians inside Iran. Remember at the time Iranians had suffered the hostage crisis and so there was a very hostile atmosphere in the US media against Iran and Iranians, including those in the US. So, the image that was painted of Iran in the American media was very one-sided and stereotypically negative. Everything was Islamic hard-liners and bearded people and angry fists in the air and women all covered up and so forth. So, for Iranian exiles that festival was sort of the first insider view of the Iran that they knew and loved. That festival became an annual event and still continues. KA: So, in 1990 you probably showed Where is the Friend’s House but not yet Close Up? HN: Close-up hadn’t come out yet. We showed it at the festival that I started in Houston. When I moved to Houston in 1992 to teach at Rice University I started another Iranian film festival with Rice Cinema and Museum of Fine Arts in Houston. That also became an annual festival which still continues. KA: That’s actually a good transition to talk about your move to Houston. You moved there before The Making of Exile Cultures comes out? HN: Yes, I got a Rockefeller post-doc at Rice to work on turning my dissertation into a book. It took me a year to do that. So, the following year, 1993, my book came out and that’s when Rice also announced a new position in film studies, their first fully-fledged film studies person. I applied for that job, they did a national search and I got the job, so I stayed. KA. : What was it like to develop your 1990s book projects in that environment? What interventions were you focusing on as you were writing them? KA: You were talking about this personal dimension of exile, and this leading to books that are so intently focused on the feeling of exile [such as] claustrophobia, anxiety, dread, longing…those kinds of things. Could you talk a little bit about how affect works in these books? HN: I think it came into my work not through theory first, but through my own experience of exile and displacement, of having an accent. Everywhere I went as soon as I began to talk people would say “where are you from?” So, my “foreignness” and “outsider-ness” were already pointed out. On the other hand, I became much more cognisant of the affect, [like] the smell of a place or of a particular food, that would suddenly transport you 10,000 miles to somewhere else, or to 40 years earlier. The senses become a lot more important to you when you are displaced or out of place. I think that’s how affect came into my work through my own synaesthetic experiences of displacement, and then through paying attention to the theory. My theorization tends to be bottom up. KA: And what has the audience been for “An Accented Cinema” Have you traced its afterlife? HN: It’s been taught in a lot of different places, like in Eastern European countries. I think it’s been translated into Turkish and Hebrew, but not into Persian, partly because some of these films are not readily available. They are esoteric films, made by smaller people, not well-known auteur directors. So, without access to the films, it’s very hard to see them and to teach and translate them. I think the internet is opening up access to some of these films. There are all kinds of openings that internet has created for alternative and minoritarian cinema. I think when the book first came out in 2001, we did have the internet, but not the kind of fast and high capacity internet that we have now, with streaming and YouTube and all of those things. KA: So that book comes out and then shortly, after a few years you moved to Evanston, to this office. HN: Yes. I moved here, because I think Northwestern has one of the first radio-television departments in this country, if not the first. It has a long history of engagement with various media and also our Department of Radio-TV-Film has various programmes, among them film production, screen writing, documentary production, and a screen cultures PhD programme, with very good and diverse faculty. And there are many others in other departments who teach film and media. So, it was very attractive for me to move here from Rice which had very few full-time film studies people who were in different departments and there was no cohesiveness to their efforts. So, I came right here to this office 11 years ago. KA: Were those links between production and studies that happen here important for your decision as well? HN: Yes, because when I teach my PhD graduate courses, graduate students in documentary production oftentimes take it. I not only teach theory and history, but also bring in production issues that film studies professors may not bring in. As a result, both the production and studies students get exposed to things that they probably would not get exposed to normally. Some of the MFA documentary students who have taken my “Accented Cinema” course have made their films inspired by that course. So, it’s fascinating to see how they interpret the material. I teach a graduate “Documentary and Ethnographic Film” course as well, which they have also taken, and they apply some of the things they learn in their studies courses in their work. It’s really nice to see what the takeaway is for them in their work. Of course, this is where my own production experience is also helpful, because I can talk in their language and point to the filmmaking techniques in terms of budgeting, styles of filming, how the group dynamic works, shooting arrangements and so forth. I think I can talk with certain authority to filmmakers who take my classes that average film studies person who doesn’t have a background in film production may not possess. KA: This was also an important move in terms of finally finishing up this project that you’ve been working on for essentially your entire professional life. HN: Yes, the four-volume A Social History of Iranian Cinema. With every article that I wrote and published on Iranian cinema or talk that I gave or every visit to an archive…that’s actually where my first English language book, Iran Media Index, comes in as well. For that book I went to a lot of archives in several countries. The whole project basically was to document from 1900 to 1981, all the documentaries, newsreels, and television news programmes that were made about Iran in the UK and the US. For that I went to many archives like, the National Film Archive in the UK, Iran’s National Film Archive, the US Library of Congress, the US National Film Archive, lots of commercial newsreel archives, etc., to produce this filmography. That sort of made me aware of the enormity of the material. Some of the findings from that book, were plugged into A Social History of Iranian Cinema when I was writing about the history of documentary filmmaking by foreigners about Iran. Likewise, other chapters were helped by the previous books that I had published. The three books that I did on exile and diaspora cinema became the impetus for a major chapter in volume 4 about the Iranian filmmakers in the diaspora. Originally, my project was to do a one-volume book, as specified by my contract with Duke University Press. After a few years of writing I realised that it was not going to be one volume. KA: And in building an argument that runs through all three thousand pages that takes forty years to create, there were massive transformations in the files along the way. Can you say something about the way you adapted the project to the way the field changed, both in Cinema and Media Studies and Iranian Studies? HN: As I was writing and doing the research, Iranian Studies came into its own, in the US at any rate. Really until the 90s, Iranian studies circles focused primarily on history, politics, anthropology, sociology and if they dealt with the arts, they were traditional arts [like] paintings, Saqqa-khaneh paintings or poetry and literature. Modern media were not really in the purview. So, one of the changes that was occurring in Iranian Studies was that modern media and pop culture gradually became acceptable topics, as a new generation of scholars were minted. In Film Studies we had, at the beginning, as I was mentioning earlier, to turn to theory that really revitalised academia in various fields, including in cinema. I was at the right time in the right place at UCLA, where a lot of these guys like Derrida, Lyotard, Habermas were coming to give talks or to teach courses. I was there and have sketches of all these people, because in all these lectures that I attended, I also sketched the individual speakers. So, I have thousands of sketches of these intellectuals with a little blurb identifying the gist of their talk. That was my notetaking. I was kind of an inquisitive child, constantly absorbing both the field of Iranian Studies and Film Studies and Critical Theory, all of which were evolving. I incorporated them promiscuously perhaps, but I hope that I have done it seamlessly and creatively enough to make a coherent argument and not be pedantic or doctrinaire about it. KA: I’m also thinking of how the field is giving more serious attention to non-theatrical media and to the links between television and film. HN: I think that is partly because I am intersectional. I’m interested in the intersections and interstices. I wrote a preface to the book Projecting Migration: Transcultural Documentary Practice, edited by Alan Grossman and Aine O’Brien, which deals with this topic; it was entitled “On the Global Inter-, Multi-, and Trans- —Foreword.” I’ve always been interested in connections and layers, in how things connect to each other. That’s where it comes from. I think the topic is also part of that autobiographical element. If you listen to and look at your own self and your own interests, you may discover that something new is there. But if you constantly try to follow the trends, you won’t discover anything new. The real newness is when you turn inward and inside and discover something there. KA: Do you have a sense of how the book was received within the field of Iranian studies, maybe among film scholars writing in Persian in comparison with those working in film studies in North America? HN: It seems to have done very well, with many reviews published in Iranian studies and film and media journals. The first volume has already been translated into Persian. There was a recent documentary that was made about me [called] Mouth Harp in Minor Key: Hamid Naficy In/On Exile. Just a couple of weeks ago this was shown at the Cinema-Vérité film festival [in Farsi: Sinama-Haghighat] in Tehran and did very well. Many fans had to sit on the floors because the cinema was so full and they scheduled new sessions for the film. The filmmaker, Maryam Sepehri, is now exploring international film festival and distribution circuits for that film. So, through the publication of translation of the first volume of A Social History of Iranian Cinema, as well as through translations of my other works in article form, people had heard enough about me to come and see this documentary about this guy who is abroad. A whole bunch of reviews and interviews with the filmmaker are beginning to come out. So, I think it has had some impact. Given the kind of national hostility between my two countries, the US and Iran, which also affects travel- the Trump administration bans travel of Iranians to the US and the Iranian government labels Iranian bi-nationals who travel to Iran to conduct research as US spies, so any time you go there you fear that your research would be taken as spying- it is a very tough field to work in, but such is both the peril and privilege of interstitial existence! K.A: What you are working on now, and what’s coming on the horizon? HN: Actually, one of the projects that I’m working is apropos of what I was just saying. Because of the lack of formal relationship between the two countries of Iran and the US, most contact between Americans and Iranians has occurred via media, in cyberspace or on television or in film. As a result of the four-volume book, I’ve been working on this idea of public diplomacy between the two countries involving not only governments’ use of media, directly or through their allies and subterfuge entities, but also by citizens’ use of media, particularly social media. That may become another book, but that one is also an evolving animal. Public diplomacy via media is a constantly evolving topic not only because of what the governments and social media do, but also because of the technological revolutions that are taking place right under our noses. So that’s one project I’m working on, on the side-line. KA: Focusing mainly on things like social media or satellite broadcasting? HN: All of them. The totality of media which I’m calling media-work, which includes all of the Iran-related media-work, in Persian and also in English, coming out of the US and Iran, including the social media that Iranians mobilise, like during various periodic uprisings or demonstrations. The other [project] is a memoir that I’ve been working on for a while. I have a huge amount of material, as usual, so the challenge here is how to not turn it into a compendium of three thousand-pages, but into something cohesive and readable for the general public. That’s what I’m supposed to be working on this year while I’m on sabbatical. KA: Thank you so much for being so generous with your time. HN: Thank you for coming up here. I hope that this will be edited into a nice bouquet of flowers!